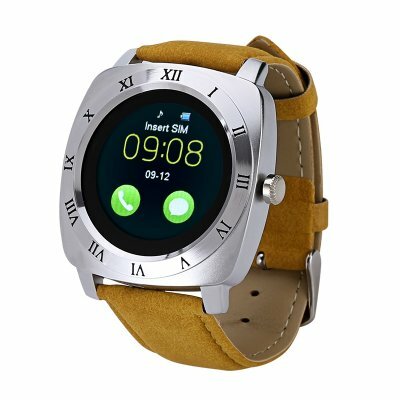 Successfully Added Iradish X3 Smartwatch - Pedometer, Sleep Tracker, 240x240 Resolution, 1.33 Inch IPS Display, Integrated Camera (Silver) to your Shopping Cart. Simply insert your SIM card and this budget smartwatch lets you dial and answer phone calls and reply to messages straight from your wrist. If you choose to use it as a regular digital watch without inserting a SIM the Iradish X3 Smartwatch still allows you to enjoy the features of your smartphone through Bluetooth connectivity even when no SIM has been inserted. This phone watch offers you the perfect platform to easily stay connected with all your friends and loved ones no matter where you’re headed. Holding an integrated miniature camera this smartwatch allows you to simply snap pictures where ever you go. It’s 1.33 Inch IPS touch screen lets you watch back your pictures and all other files in HD resolution, providing a clear and sharp image and fully enhancing your overall user experience. Offering the possibility to add an additional 32GB of external memory you can be ensured that you won’t run out of storage space for your files and pictures anytime soon. Besides the basic smartphone features the Iradish X3 Phone Watch also features a pedometer and sleep monitor through which it can gradually support you in increasing your health and motivate a more active lifestyle. With its built-in speaker, this little budget smartwatch furthermore enhances your user experience by giving you the possibility to sync the watch to your smartphone’s music library and to play all your favorite tracks while working out. Iradish X3 Phone Watch comes with a 12 months warranty, brought to you by the leader in electronic devices as well as wholesale electronic gadgets.. This product looks very goood though i am yet to look at the performance of the batery life.Looking very nice.